This list of my Top 10 Favorite Kitchen Gadgets is an update from 3 years ago. I figure it was time to come back in and see what gadgets and tools I still use regularly and which ones had fallen by the wayside. I was pleasantly surprised to see that there was only 1 kitchen tool that, three years later, I am still not using regularly! And while I hate to name names, it sounds a little like smiralizer. Full confession: I love kitchen gadgets! Some (my husband) might say it's an unhealthy obsession. If I were a chocoholic, it probably wouldn't be wise for me to work at Godiva Chocolate. If shopping were my addiction, I probably need not work at The Mall of America. Well…if kitchen gadgets were your addiction, Williams-Sonoma might not be the best place for you to work…if you actually wanted to bring home a paycheck. While I did love working at Williams-Sonoma, my husband swears that our bottom line is greatly improved since I left the store…go figure. And while I'm not a medicine cabinet snoop, I am a kitchen gadget drawer snoop. It's always eye-opening to see what gadgets my fellow kitchenistas keep on hand and actively use. 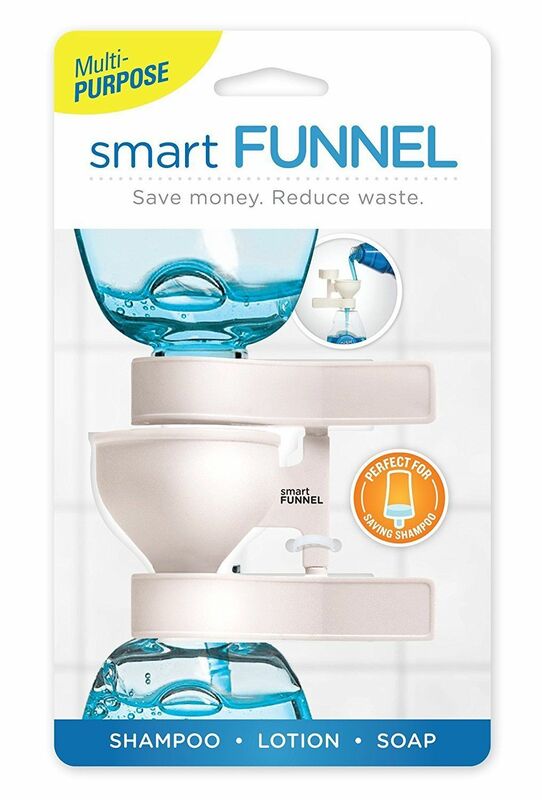 This Smart Funnel comes in very handy to get every last drop out of my syrup and oil bottles, as well as my lotion and shampoo bottles…and it's completely dishwasher safe. I have had mine for probably 7+ years…in fact, it is stained with some yellow acrylic paint…I don't even remember using it for paint. But this little gadget is used very regularly in my home. When I worked at Williams-Sonoma, this was one of the items that we would sell out of quickly and when it came back in stock, would be bought in multiples. It's so much more functional than many other lemon juicers out there, proving that simpler is often better. And while I do still appreciate my reamer, probably 2 years ago I got one of these in my stocking and sadly, the reamer is not used quite as often. I like the added benefit that the reamer collects the pulp and seeds and lets the juice run through to the cup. 3. A Gravy Fat Separator is another of my favorite kitchen gadgets that I continue to use frequently when making stock and gravies. It works like a charm to separate the bad fat from your good stock and broth. 4. I can't even begin to tell you how many garlic press/crushers I've owned since I've had my own kitchen. I have had many of the traditional hinged ones and some not so traditional ones. I found this one several years ago in a fantastic kitchen store in Charleston, SC and it is my hands-down favorite ever garlic press and surely one of my favorite kitchen gadgets. My search for a garlic press is over. There's nothing to break and it washes up great. I really like that there is no garlic waste…no garlic to get stuck in the press. And for recipes for which I want smaller bits of garlic, I can easily scrape the garlic off after the first run, put it back onto my cutting board and then rerun the garlic crusher over it again for smaller pieces of garlic…once again with no waste! 5. I'm not a frivolous gal. I like to think I'm rather utilitarian, with just a little side of bling. When it came time to replace my KitchenAid blender, I looked long at hard at my options. I kept coming back to The Vitamix Blender, but the price tag was hard to swallow. Ultimately, we bit the bullet and are so glad we did. We LOVE our VitaMix. If you are a Costco member, they often have VitaMix events, which is when I got mine. Without exaggeration, this VitaMix is used at least once a day, usually twice. Making smoothies is a breeze. We've made (and heated) soup in our VitaMix. I make almond milk, coconut milk, almond butter, peanut butter. When I make our cubed foods, the VitaMix is indispensable! Recently, I was making a recipe that needed Tahini; I thought I had some but realized mid-recipe that I didn't. I did have a bunch of sesame seeds, so I ran them through my Vitamix until they formed a sesame paste and voila…Tahini! I haven't tried grinding grains; I don't have the container for that, but it's on my wish list. From my Williams-Sonoma experience, I never heard or saw anyone ever complain about their VitaMix or return it to the store. It's a good product. I stay away from non-stick cookware; the whole chemical process to make them non-stick gives me the heeby-jeebies. As such, I rely on my cast iron skillets when I need a non-stick surface. Well-seasoned cast iron gets you pretty darn close to non-stick…close enough that I don't feel the need to have a true non-stick pan. The key is that they really do need to be ‘well-seasoned', which if you do some simple ‘maintenance' is really not a big deal. No, you cannot toss them into the dishwasher and no, you shouldn't use soap on your cast iron. My drill is like this: After it's cooled down, I scrap it out and use this metal mesh scrubber to get all the bits of food off. Truly though, a well-seasoned cast iron surface really doesn't need much scrubbing and never needs soaking. Once cooled, I put it away. Granted, there are a few more steps involved than tossing in the dishwasher, but I am happy to them for the benefits of using cast iron: even cooking, they can go from stove to oven, relatively inexpensive, the surface won't scratch, they are almost indestructible, no harmful materials or chemicals and their non-stick surface. And it's just become part of our post-dinner cleanup. I have 3 sizes of round skillets (12″, 10″ and this set of 4 5″ cuties that I use for mini skillet pies, brownies, and my clafoutis) as well as a cast iron dutch oven and a grill/griddle combo. The Grill/Griddle is great if you need to grill indoors or for a big batch of pancakes. 7. My Cuisinart 12-Cup Food Processor is another kitchen staple that is used on a regular basis. I like the one I have because it has a smaller nesting bowl for when you need to process smaller amounts. The reversible shredding blade has a thin shred and a thick shred. My most recent uses for my food processor include making Thai Basil Pesto, making the crust and crumb for my Cherry Oat Bars, slicing the cabbage for our Thai Black Rice Bowls and grinding eggshells for compost. I also use it for making pate brisee for all my pie-ish things, like these mini Pecan Pies. The only downside is that it's a heavy thing. O.K. How much does it bug you when you are whisking something thick and a good clump of batter gets stuck in your traditional balloon whisk? Bugs the crap out of me! Enter this genius gadget! Not only does this whisk eliminate having to get the batter out of the balloon, it also gets into corners better and seems to incorporate your ingredients much more efficiently. My balloon whisks sit idle as this is my go-to whisk for just about every whisking task. This one was a no brainer when chosing my favorite kitchen gadgets! 9. My 5″ Wusthof Serrated Utility Knife. Sometimes, when I'm feeling frivolous, I think I really need 2 of these knives as the one I have is always being used. But then, I settle back to the ground and realize I could just wash it after every use so that it's always available. A very handy knife for cutting vegetables, fruits, and meat and is always in use in our kitchen. We are a cookie baking family and these baking mats are so handy! There are more expensive brands, which I also own, but have found the Amazon ones equally as effective at keeping foods from sticking. Obviously, I use them for cookies, but also I have a set just that I use to get the proper size for macarons or smaller cookies. We also use them when we flash freeze fruit so that the fruit doesn't stick to the pan, we use them when we bake crackers or pizzas and potatoes. In fact, whenever you would use parchment or aluminum foil you could use a silicon mat, eliminating a whole lot of waste in your kitchen. 11. 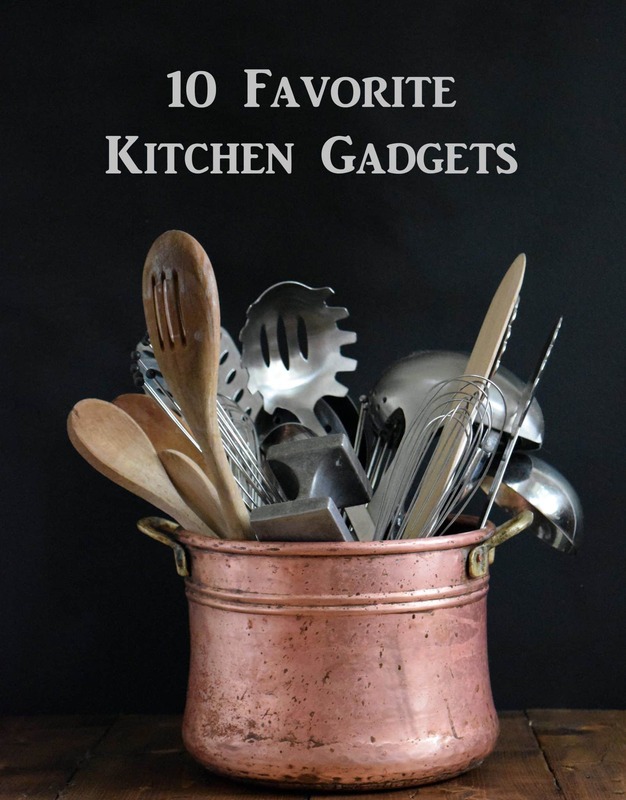 I know I said '10 Favorite Kitchen Gadgets', but I recently discovered the 11th favorite! And I can't believe I didn't discover this little ‘gadget‘ sooner. One of my all-time LEAST FAVORITE cooking chores is peeling garlic…but…not any more! My mom recently gave me one of these little tubes and it has changed my outlook on garlic. This little gadget makes it SO EASY to remove the thin, papery garlic skin. Makes an EXCELLENT stocking stuffer. What got left off of the list of Favorite Kitchen Gadgets? OK…and let's talk about what got left off of the list…the spiralizer. I loved my spiralizer at the time and I'm all about zucchini noodles…but it's star started to fade because of the cleanup for such a limited use tool. I still have it…and don't have immediate plans to get rid of it…but it hasn't been used in quite some time. Do you use your spiralizer? What are your go-to favorite kitchen gadgets? As I said, I'm always drawer snooping, so I'd love to ‘virtual snoop' in your kitchen drawer to discover your favorite kitchen gadgets that I just can't live without! Bookmark this page of Favorite Kitchen Gadgets or pin the following image for your future reference. I also have some favorite tools, for instance my 1″ cookie scoop for my energy balls that we keep on hand all the time. (I broke my melon baller which was perfect.) I got a drain thing from Pampered Chef that I use to drain the canned chicken or tuna, and it squeezes out the juice really nicely. We have a Ninja that we make our supper smoothies with, and it is drying on my dish drainer right now, it gets used nearly every day. I so agree with you about the baking sheets for cookies and such. Love it! I am so intrigued with your Profi whisk! I have two of the traditional balloon type and while I like the results, I always dread having to wash out the crevices! I used to have cast iron skillets, but I’ve gotten rid of them because they’re just too darn heavy! I’m 74 and my arm strength isn’t what it used to be. Hey Sue, those cast iron pans are quite heavy! And you must try that Profi Whisk! Like you I dreaded cleaning out those balloon whisks…but not a problem anymore! It’s Genius I tell you!! And I have one of those scoops which I love too…may have to do a sequel! Thanks so much for sharing your favs!!! I love this virtual field trip to your kitchen! I have two favorite gadgets; one is the Swiss Pro veggie peeler that can be used either left or right handed. The other is the Ninja food chopper. Chopping is a very quick with a pulsing motion. You can chop from coarse to very fine. Clean up is a breeze. List price is less than $25 & is well worth that. Hey Gayle! I have not heard about that Swiss Pro Veggie peeler, but just checked it out and it is very highly rated. Hmmm…when my current bites the dust, think I’ll give it a try! And haven’t tried that Ninja food chopper either! Hmmm…I can always use help chopping. Thanks so much for sharing two of your favorites my friend. You know I love kitchen gadgets! I have to check out that garlic press. I have problems with my hands but have been discouraged with the cleaning required the presses I tried. Something I use a lot is a julienne veggie peeler. Quick and easy to use when shredding veggies/garnishes for a salad for one or two especially! That garlic press is so easy to use and to clean up. It might help you…I know that I find it MUCH easier to clean up than the traditional presses. And I use one of those julienne peelers too…so much easier than a spiralizer. I couldn’t do without skinny rubber scrapers and the broad metal gadget that scrapes up bread dough. I use my pastry blender often too, but for chopping up hard boiled eggs. As for cast iron pans, they’re just too heavy for my old arms. Love my enormous copper pot, though, for everything from soups and stews to no- knead bread. I bought it years ago for $125 At Bloomingdales, which was a huge splurge. I’d hate to think what it would cost now. Oh, I’m so jealous of your big copper pot! I’ve been coveting them for too long, but haven’t quite made the splurge yet. Aren’t you glad you did!? We use those little skinny rubber scrapers as well, but don’t have a metal dough scraper. As much as my grandma baked, I’m surprised she didn’t have one that was passed down to me. Cast iron has always been my favorite cookware. Besides the 10” & 6” skillets & a grill/griddle, I also have a flat skillet that is called a spider. It’s great for heating tortillas. I have a 5” shallow skillet that’s perfect for one egg. I did have a deep 12” skillet & a Dutch oven, but they are too heavy for me to lift now, so my daughter ‘inherited’ them, along with two other cast iron skillets, when she bought her first home. Hey Gayle, I need to check out that spider! And don’t you love those little 5″ skillets! So many possibilities. And your daughter is one lucky gal! My mom is still holding on to her cast iron. I did purchase a skillet for our daughter when she set up her apartment at school…it really is such reasonably priced cookware.